"I came across this wonderful resource a couple of days ago through TechChef4u and after checking the forms it has I decided to share it with you. This is basically a treasure trove packed full of handy Google forms you can use with your students in the classroom. There are also forms for administrators and another selection for professional development. So those of you who do not have time to design their own forms, this page is a must bookmark for future reference. 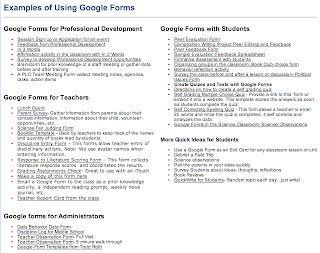 If you are not yet familiar with how to use Google Forms and want a head start, check out the resources below."